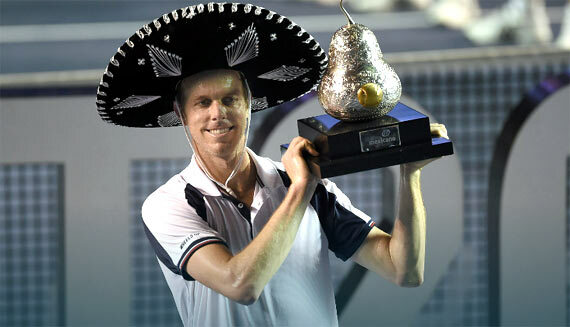 Sam Querrey produced a stunning performance to shock Rafael Nadal in the Abierto Mexicano Telcel (Mexican Open) final. The American completed an impressive tournament with a 6-3 7-6 (7-3) win over 14-time grand slam champion Nadal on 4 March, 2017. Querrey had lost all four previous meetings with the Spaniard, but that changed on the back of a strong serving display and power hitting. Nadal became his latest and biggest scalp at the ATP 500 event, having beaten Dominic Thiem, David Goffin and Nick Kyrgios on his way to the final. The ATP World Tour title is the ninth of Querrey’s career and first since February last year. He became the first American to beat Nadal since Mardy Fish in 2011, breaking a 16-match run by the left-hander against players from the United States. Querrey served 19 aces in his win and delivered in big moments, saving all six break points he faced. His hard hitting saw him break in the eighth game of the first set before closing out the opener, becoming the first player to win a set against two-time champion Nadal in Acapulco. A tough hold at 3-4 in the second set, saving five break points, proved crucial for Querrey. Errors from Nadal gave Querrey the upper-hand in the tie-break as he secured a surprise win, becoming the first American to win the title in Mexico. At the Brasil Open, Pablo Cuevas remains on track for three straight titles after reaching the final, where Albert Ramos-Vinolas awaits.